Tong Yixin is an artist. The Disappearing Archives Project is a discursive/curatorial platform initiated for a series of personal archives, geographic contours, historical imaginations, and theoretical propositions. 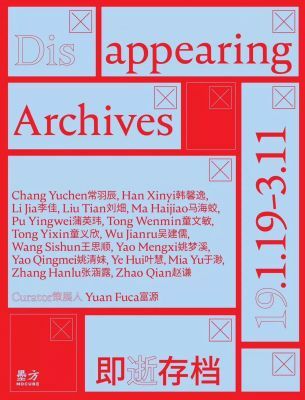 Through the collection, organization, and presentation of archival contributions from various sources, Disappearing Archives contemplates and further complicates the notion of disappearance. The disappearing is, on the one hand, often understood as the depletion of resources and species, historical erasure, and detained or even murdered bodies, but on the other hand, it stimulates our desire to see the world in new ways. Baudrillard wrote, “The real world begins, paradoxically, to disappear at the very same time as it begins to exist.” By their exceptional faculty for knowledge, human beings build the real world by giving meaning and value to things. This process of naming and conceptualization acknowledges the existence of the object, but it also separates that object from its original reality. At the same time, concepts also shape the way in which we understand the world. The creation of an archive is like giving something a name; it annotates and attenuates experiences through language. As a creative form, how do archives reduce the attenuation of an experience’s original strength? Or, as a critical medium for challenging the systems of knowledge construction that underpin them, can archives be seen as an attempt at changing increasingly homogenized intellectual paradigms in a globalized present? Disappearing Archives has collected archival contributions from 16 artists, writers, curators, and researchers, creating a provisional repertoire from a series of texts, images, sounds, videos, and performance materials that deal with personal ecological discoveries on international trips, feminist spaces in modernist paintings, the imbalance between contemporary migration and capital flows, ritual traditions, and the fanaticism of certain pastimes. Here, the concept of disappearance is performative and situated; it is present in the visible, continuous, and generative threads that make up every archive, capturing the archivist’s emotions, intelligence, and all-encompassing efforts. Whether it is a suggestion of a political tendency or a human intellectual barrier, the absoluteness of truth has started to relax within these gradually manifesting traces.